As it pertains to ESPN’s list of the world’s most famous athletes, Deontay Wilder has emerged as the face of boxing. The unbeaten heavyweight titlist made his debut on ESPN’s annual “World Fame 100” list, appearing at number 34 among the 100 most famous athletes in the world today. Wilder (40-0-1, 39KOs) is one of six boxers to make the cut, the deepest the sport has run in the four years ESPN has compiled such data. World-renowned footballer Cristiano Ronaldo and NBA legend LeBron James rank one and two, respectively; they’ve held those two positions every year since such rankings were first introduced in 2016. Wilder is actually on the low end of sponsorship ($1.65 million) and social media following (2.5 million followers) but boasts a perfect 100 score in terms of Google searches. Undoubtedly, the long-reigning heavyweight titlist will once again wear out the search engines upon Tuesday’s announcement of his May 18 clash with Dominic Breazeale heading to Showtime. 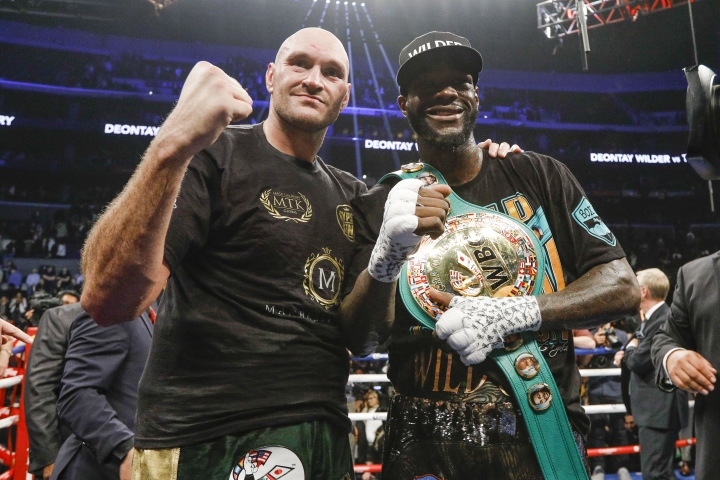 Five spots below Wilder was his most recent in-ring rival, England’s Tyson Fury (79 Google score; $2.65 million in endorsements; 21.5 million social media followers) who also made his World Fame 100 debut as he landed in the number-39 slot. Interestingly, the unbeaten Brit is the only boxer on the list who fights on the ESPN platform, although for now just contractually as his debut under his recently inked deal won’t come until June. Wilder and Fury generated headlines in the buildup to their Showtime Pay-Per-View headliner last December. Their fight ended in a disputed 12-round draw, with the outcome—along with Wilder’s dramatic 12th round knockdown which nearly had Fury out—became the talk of the town, enough to where they’ve become the most identifiable figures in the sport according to data collected by ESPN. The last of the big three heavyweights on the list, Anthony Joshua is one of four returning boxers to make the cut. The unbeaten, unified heavyweight titlist ranked number 63 this year, down 17 from his 46th place ranking in his World Fame 100 debut one year ago. Joshua (22-0, 21KOs) earns $7 million in endorsements, far and away the most of any other boxer on the list. Joining England’s Joshua as repeat entries are Mexico’s Saul ‘Canelo’ Alvarez (58th)¬—a two-division and reigning World middleweight champion—and Philippines’ Manny Pacquiao (83rd), the former eight-division titlist. Alvarez and Pacquiao are the only two boxers to have appeared on the World Fame 100 all four years since its inception in May ‘16. Alvarez debuted at 84, dropping to 89 in May ‘17 and improving to 58 in ‘May 18, no doubt stemming from his 12-round draw with Gennady Golovkin (who debuts at 78 on this year’s list) in Sept. ’17. Pacquiao debuted at 35 in May ’16, the period tracing back to his May ’15 clash with Floyd Mayweather (26th in ’16, 14th on last year’s list). The six boxers to make the cut list there eclipses the 2018 list which boasted five prizefighters—Mayweather, Joshua, Alvarez, Pacquiao and Wladimir Klitshchko, the latter whom was also on the inaugural 2016 list. What is this crap about! To what end is this rec to boxing?